The World Cup switched to second gear yesterday with the Round of 16 fixtures underway and it started with the hosts, Brazil, taking on a Chile side that was impressive in the Group Stages. Winning Australia seemed pretty routine but knocking Spain off their perch sealed qualification for the South Americans and raised a few eyebrows. The group decider was a clash with the Netherlands that ended in defeat. From an Arsenal perspective, the name Alexis Sanchez has been mentioned a couple of times and the forward has been linked heavily with a summer move to North London. As for the game itself, it was what I expected from two South Americans locking horns – brilliant attacking football, end to end stuff and all action. After a couple of close shaves, the Brazilians took the lead from a somewhat scrappy David Luiz goal but the Chileans grabbed an equalizer thanks to a brilliant side-footed finish from Sanchez (sign him up!). Both nations continued to have a go at each other and sadly, 90 minutes wasn’t enough to settle the contest so the game went into extra time. As expected, fatigue started creeping in and the Chileans were hit harder because they did more of the defending in the course of the game but in the 119th minute, Chile’s Mauricio Pinilla had a break and he slammed a shot against the cross bar with Julio Cesar clearly beaten. With the 30 minutes not being enough, it was down to five individuals that would become heroes or villains. This made me flashback to Arsenal’s Round of 16 fixture against AS Roma in the 2008/09 campaign. After winning with a single goal at the Emirates, the Gunners conceded a goal at Stadio Olimpico and everyone knew that the team that scores the next goal will advance to the quarterfinals. Despite the best efforts of both sides, that elusive goal failed to arrive and the extra 30 minutes wasn’t enough so they had to go all the way to penalties. Arsenal won 7-6 in the shootouts and went on to win Villarreal in the quarterfinals before losing to Manchester United in the semis. Snapping back to reality, Chile had a couple of bad misses and in the end, the Brazilians advanced to the quarterfinals after Gonzalo Jara’s effort smashed the post. The other Round of 16 fixture was also an all-South American affair with a Luis Suarez-less Uruguay taking on a Colombia side that has been an inspiration in the tournament thus far. With the controversy out of the way, it was time for Uruguay to let their football do the talking but boy, where they in for a surprise or what. The first goal was a master class from the best player in the tournament thus far. After receiving the ball on the chest, James Rodriguez had the audacity to blast the ball at goal leaving Fernando Muslera no chance in Hell. Even Uruguay’s manager, Oscar Tabarez confessed that it was one of the best goals he has ever seen. Rodriguez was on hand again to side-foot Andres Cuadrado’s looping header to put the game beyond Uruguay. In the absence of Luis Suarez, Diego Forlan looked out of sorts and as for Edinson Cavani, I reserve my comments. When AS Monaco signed Rodriguez for over 45 million Euros, everyone thought that he was another overhyped player but in 105 games with FC Porto, the youngster scored 32 goals and supplied 21 assists. He even performed admirably in his first season in Ligue 1 with 10 goals and 12 assists in 38 appearances and next season, he would be featuring in the UEFA Champions League alongside his compatriot, the goalscoring machine, Radamel Falcao. Today sees the Netherlands take on Mexico while this World Cup’s surprise package, Costa Rica, will play Greece in the late fixture. As we all know, the Round of 16 begins today as nations would fight each other to go all the way in the competition. With 48 games already played and 136 goals scored already, the World Cup has been an entertaining spectacle with the excitement levels reaching an all-time high. Why don’t we reflect on some of the lessons that have been learned from the first phase of the competition Gooner Daily style! I must confess, it has been a welcome change seeing referees spray that vanishing whitish fluid on the pitch when coordinating the defensive wall for dead balls but there have been games when I’ve been bewildered by some of the decisions made by the officials in this tourney. Right from the very first game in the tournament, the peripheral Fred fell a sack of potatoes after a mysterious challenge from Southampton’s Dejan Lovren and the Japanese ref awarded a penalty and ran into the box to brandish a yellow card to prove how convinced he was. Then there was the case of the Brazilian-turned-Spaniard, Diego Costa, that conned the ref into giving a penalty in Holland’s routing of Spain. The most painful penalty decision of all would be Giorgios Samaras’ penalty against Ivory Coast that came right at the death to break Ivorian hearts. It hasn’t just been about the penalties though. There have also been the wrong offside decisions as well as the disallowed goals – think Edin Dzeko against my native Nigeria. We have reached the business end of the competition and I can only hope that the officiating improves. There were some players that were tipped to deliver in the tournament and boy, have they lived up to expectations. Despite his tumultuous time at FC Barcelona, Neymar Jnr. is at home and with the iconic No. 10 at his back, he has been a light in shining armor for the Selecao. Lionel Messi is another player with a vendetta as he seeks to win the only major trophy that has eluded him – the trophy Pele continues to spite him with. Another South American hitting top gear has been Colombia’s James Rodriguez, and despite his tender age he has been a class act for his nation in the absence of the influential Radamel Falcao. Some European juggernauts have also turned up to the party and one can look no further than Holland’s Gotham representatives, Bat van Persie and Robben. Then there’s also Germany’s Young Mueller baby and France’s own Beamer, Benzema and Bentley. 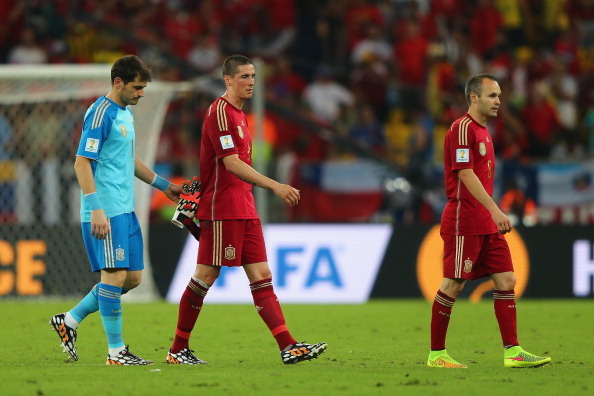 On the other side of the pendulum, there have been some major flops and this would be a World Cup the defending champions will want to forget with Iker Casillas in particular. His shambolic club form crept into his national performances and seeing him struggle against Holland and Chile was a painful sight. why the long faces guys? Roy Hodgson and his average overhyped England squad were rooted to the bottom of their group and its back to the drawing board for the English gaffer, that’s if he retains his job. It was also a disappointing campaign for the current World Footballer of the Year, Cristiano Ronaldo, which could affect him retaining his crown this year. Like previous World Cups, there were a lot of jaws dropped as some highly respected nations booked their flights out of Brazil following their below par performances in the tournament. Shockingly, Spain was the first nation to get eliminated from the World Cup, even before a Cameroon that was marred with internal strife. In a group that seemed reasonably easy on paper, Ivory Coast crashed out of the tournament, albeit acrimonious circumstances but they were the plotters of their own downfall, like the goal they conceded against Colombia. I never expected England to qualify from Group D but seeing Italy go down with them was certainly a surprise. Cesare Prandelli tendered his resignation afterwards. The same can be said about the Portuguese national team that has a relatively average squad with the exception of its captain, CR7. However, I still felt that they would qualify with Germany. 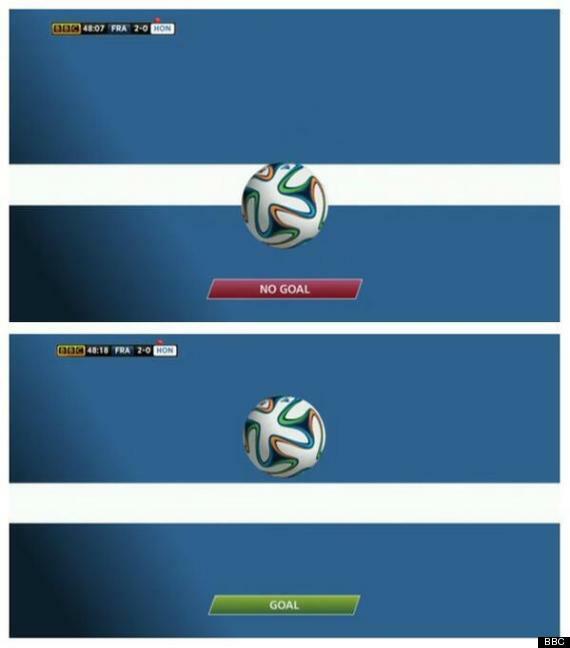 Despite the fact that I’m not a fan of Sepp Blatter and his corrupt practices, I feel that the goal line technology simulation was a step in the right direction. At first, it was becoming a nuisance as the simulation was even shown when the ball had crossed the line to hit the net and I felt that they folks that made the software were just showing off. Then it came to good use – its intended use in the game between France and Honduras. Yohan Cabaye threaded an inch-perfect ball to Karim Benzema and the Real Madrid forward side-footed the ball beyond the Honduran goalie but it hit his far post. The ball came back into play and crept beyond the line before the keeper smothered the ball. The referee had initially trusted his instincts and awarded the goal but on watching the goal line technology simulation, it showed that his instincts were spot on. Moving forward, I believe that the simulation would aid teams to avoid decisions that can change the outcomes of games. Every World Cup is expected to have its fair share of controversy but one must wonder if Luis Suarez is being tormented by some strange powers in the dark side of the Moon. With Costa Rica getting a shock win over Italy, their qualification was ensured so the Italy vs. Uruguay match promised to be a mouthwatering prospect. The game itself was a reasonably dull affair that was settled with a good header from Diego Godin but the game will be forever remembered for Suarez doing what he does best – trying to render a piece of meat off an opponent’s flesh and it was appalling seeing him fake an injury afterwards. FIFA has done the right thing to punish him but one wonders if just four months out of the beautiful game would be enough for the Uruguayan biter to learn his lessons. Suarez is meant to be an asset on the pitch but his shenanigans off it makes him a liability. Let’s hope for some great football in the Round of 16. With the proceedings of Group A and B done and dusted, all eyes were firmly focused on the activities in Group C as the already eliminated England took on the group’s surprise package, Costa Rica, while Italy and Uruguay locked horns to decide the team that would follow the Central Americans to the Round of 16. Like Vicente del Bosque, England’s gaffer, Roy Hodgson, opted for a new look side but he left Danny Sturridge as the focal point of attack. The Liverpool forward had a couple of half chances but the best goalscoring opportunity arrived when Costa Rica’s Celso Borges blasted a free kick that threatened Ben Foster’s goal. The game had a naturally dull outlook to it and it was expected given the fact that a team that had already qualified a late rooted to the bottom of the table. Cameroon were also in last place when they took on Brazil and despite their 4-1 romping, they gave a good account of themselves against the host. In the other game between Italy and Uruguay, it was a nervy affair but as soon as Claudio Marchisio got sent off, the South Americans sprung to life and after a series of dead balls, Diego Godin rose the highest to head Uruguay to qualification. Italy put up a spirited display in the tail end of the game but it was too little, too late. However, the game will be marred by an incident in the 79th minute when Luis Suarez attempted to get a chunk of flesh from Giorgio Chiellini’s shoulder. There were visible teeth marks on Chiellini’s shoulder and one may be wondering what gets into Suarez’s head sometimes. This despicable act earned him suspensions in Ajax and Liverpool, now he has brought his cannibalism to the world stage and it’s truly shocking. Chiellini has demanded that FIFA take some action in this regard and one must wonder what goes on in Suarez’s head sometimes. With Italy crashing out of the competition, Cesare Prandelli has tendered his resignation with immediate effect. Following Marcelo Lippi’s dismissal in 2010, Prandelli forsaked his job at AC Fiorentina to take charge of the Italian national team. 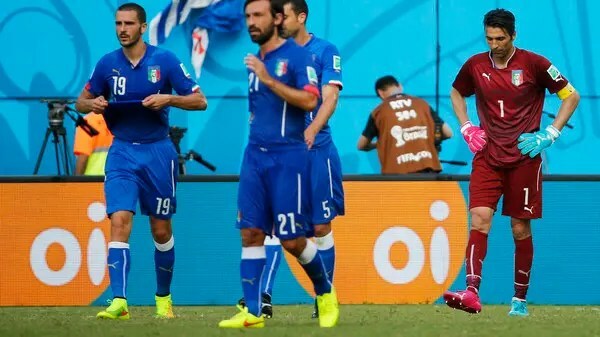 After winning the World Cup in a year when the Serie A was under heavy scrutiny, Italy qualified for the 2010 World Cup and crashed out of the group stages. This summer, it has been a classic case of deja vu so its arivedecci for the Azzurris. Another giant has crumbled in the World Cup and trust me, they won’t be the last. Late on, there were two games in Group C that had to be addressed with Ivory Coast taking on Greece while Colombia played with Japan. The South Americans chose to rest their talismanic youngster, James Rodriguez, and when he arrived on the pitch at the start of the second half. With Rodriguez pulling the strings, he set up two goals for Jackson Martinez before scoring a peach of a goal. Finally, Africa watched and hope that Ivory Coast would at least have enough in the tank to shove off the challenge of Greece but as things panned out, Greece scored a late goal right at the death to secure qualification to the next round. The Greeks had gone ahead from Samaris but Wilfried Bony leveled the encounter. The buildup to the late goal was adjudged to have been fictitious but when Giorgios Samaras clipped his own heels when he attempted a shot. Despite’s Barry efforts to put Samaras off, he couldn’t reach the ball as the spot kick sailed past to put the game beyond doubt for Mexico. I guess Emmaneul Adebayor was right. Ivory Coast will always disappoint. I’ll keep you updated as more matches are being played.